A dual-purpose blog post this time—a science story and a book review—but on a single theme. First, the news. The headlines read, “Scientists Have Reversed Time In A Quantum Computer” and “Scientists Have Built World’s First Time Machine”. Well…let’s not get carried away here. The truth is that researchers in Russia working with others in Illinois U.S.A. programmed a quantum computer to return a particle to an earlier state. The quantum computer involved two particles—yes, that’s how small and basic it was. We know that, according to the “arrow of time” things change as time passes. Everything moves and changes, and it should never be possible to return to the exact same place and condition an object was in a moment before. But, first of all, strange things can happen at the quantum level—the smallest level of existence we know about. And secondly, this experiment was essentially a simulation. Think of shifting your car into drive with your eyes closed (don’t try this at home). After a few seconds of travel it could be in a range of possible new locations (middle of the street, your neighbour’s yard…). These scientists created a simulation to move your car back into your driveway from wherever it got to. Their tiny ‘computer’ was programmed to simulate the return of one qubit (quantum particle) to a previous state, and after thousands of attempts, they were successful about 85% of the time. Did they reverse time? Break the laws of physics? Not exactly. And, lets be fair, they’re not making any of these outrageous claims themselves. Their hope is that this process will provide a way to check the results of a quantum computer by repeating them. They’re not saying they can now transport Marty McFly back to 1955. Could this lead to a method of time travel for objects and people? It’s hard to see how. The quantum world underlies the world we experience, but particles that small don’t behave like any objects we encounter. They can act like both a particle and a wave. Entangled quantum particles can affect each other instantly over (apparently) any distance. It’s spooky stuff. Like magic. Which brings me to the second quantum experience of my week, reading the science fiction novel The Quantum Magician by Derek Künsken. With a genetics background (genetically engineering viruses) and worldview experiences that include some time as a Canadian diplomat, Künsken’s debut novel features hard science and a social conscience in equal measure. The main character, Belisarius Arjona is a Homo quantus—a quantum man—one of three genetically-engineered forms of humanity in Künsken’s far future interstellar civilization. His brain can act like a quantum computer, processing fantastically complex calculations and perceiving a dozen different dimensions, yet he makes a living as a con man. He becomes involved in the biggest con of all time, with interstellar war an almost certain outcome. With a crew that includes a man adapted to live at crushing ocean depths and a miniature human engineered to worship his overlords, Belisarius travels wormholes through space/time in an effort to not only pull off the con but also free himself from his genetic baggage. Unlike so many SF tales that just offer one-darn-thing-after-another, Künsken serves up rich themes and deep issues. While the science is stunning, Künsken is also adept at exploring the social contexts of his imagined species, invoking the whole spectrum of emotions in the reader from revulsion, to empathy, to love and wonder. A heist story with bizarre human mutations and exotic physics—what’s not to like? (Well, the con sometimes feels a little too complex, and quantum physics makes my head hurt, but those are small quibbles!) With The Quantum Magician and it’s forthcoming sequel The Quantum Garden Künsken has fulfilled expectations from his impressive short story credentials and provided a treasure for lovers of hard science fiction. 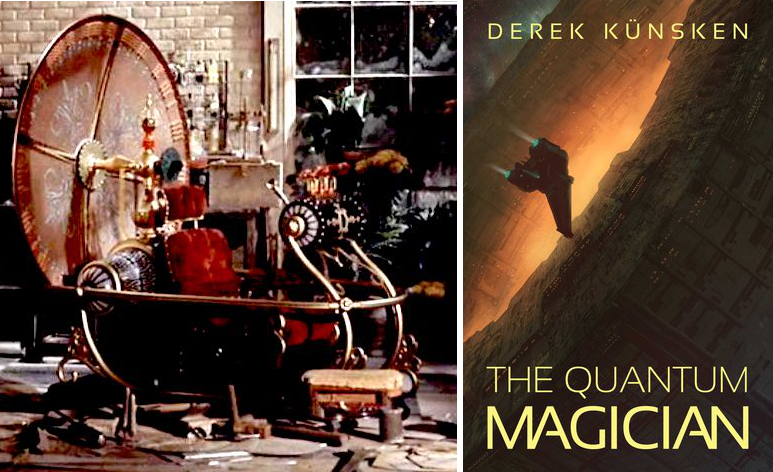 You may wish for a time machine so you can go back and read The Quantum Magician for the first time all over again.